Drones are often used to take pictures (or shoot video) from the air. Which is what I was certainly doing on this April afternoon (see e.g. 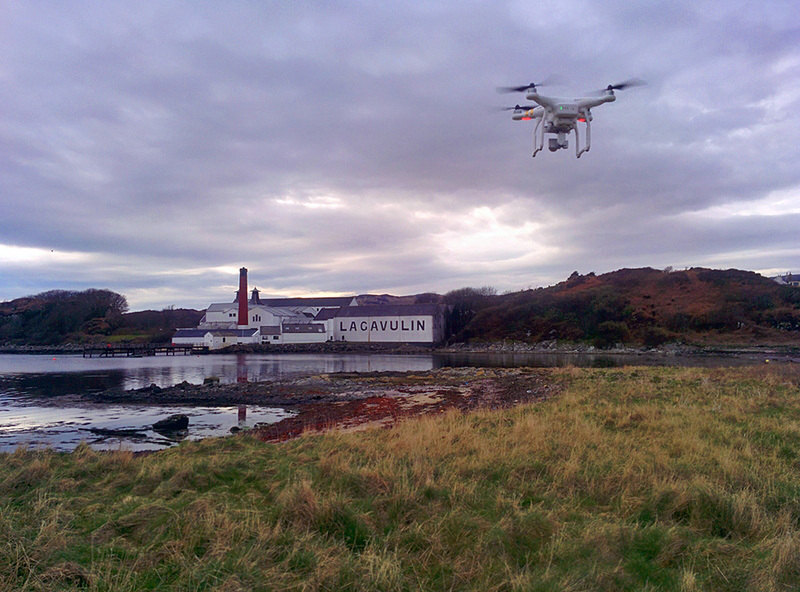 Lagavulin distillery and Dunyvaig Castle from the air), but at the end of the flight (the battery indicator is showing nearly empty) I had a few seconds left to take a quick snap of the drone in action before landing it safely. This entry was posted in Beaches, Cloudy Weather, Distilleries, Islay from the air, Landscape, New Post, Sea Loch and tagged Islay, Lagavulin, Lagavulin Bay by Armin Grewe. Bookmark the permalink. As much of Lagavulin’s peaty dew as I’ve consumed, it cheers me somewhat to think of it as an actual place and not just a bottle, heh. I would agree, a sense of place is important to enjoy a good single malt. That’s why I typically don’t drink blends or those “mystery distillery” brands where you don’t know where it comes from. Been thinking of getting a good one of these but can’t decide on the main purpose, photography or FPV or a bit of both albeit neither very well? Depends on what your requirements are, also your budget. The high end models these days give you 4k video with excellent stabilisation.